Monday's first witness in Oscar Pistorius's murder trial was forced to trawl her memory for the exact positioning of her body and feet on the morning she heard screams and shots coming from his house. "Is it also possible that you could have sat at the lower end of the bed?" asked Pistorius's lawyer Kenny Oldwadge in a series of repetitive movement-by-movement questions put to Stipp in the High Court in Pretoria. She had to wrack her brain over details such as whether her feet were on the floor or not, which position her body was in when she heard screams, the distance from a reading lamp to a balcony column. Stipp's radiologist husband Johan was the first doctor at the scene after going to Pistorius's house to see if he could help after hearing screaming. Stipp said she had seen lights on at a house across the way, a man and woman's screaming, and six shots. She found out the next day that it was Pistorius's house and that a woman was killed there. Oldwadge pedantically challenged her evidence, wanting to know whether the screaming she heard was "muffled" or that of a person in an enclosed space. After yet another question on the exact timeline from when she woke up at 3.02am in a coughing fit, to the time she looked at her clock to see 3.17am, she sighed and said: "Again, I cannot absolutely agree with that." At one point she countered that she was not making notes at the time. In the early hours of February 14 last year, Pistorius shot dead his girlfriend, Reeva Steenkamp. The sprinter, nicknamed "Blade Runner", has denied intending to kill Steenkamp, contending that when he fired four shots into a locked bathroom door. He believed there was an intruder in the toilet cubicle. The paralympic athlete has pleaded not guilty to charges of the premeditated murder of Steenkamp; as well as contraventions of the Firearms Control Act. 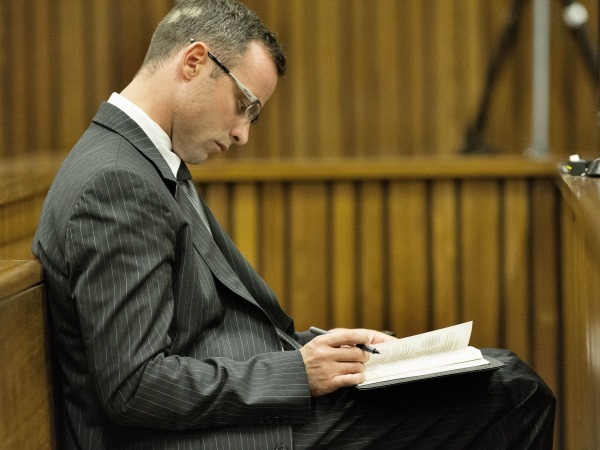 The firearm contraventions are linked to separate incidents in which Pistorius allegedly fired a pistol under a table at a Johannesburg restaurant in January 2013, and allegedly shot through the open sunroof of a car while driving with friends in Modderfontein in September 2012.